So, I should be doing some notes, homework, and preparing for a presentation for my Spanish class Monday. But what am I actually doing? My nails, of course. That’s OPI’s Skull and Glossbones, Art Club’s Silver (the brush is super thin for detailing), and Red Carpet manicure’s nail glitter. 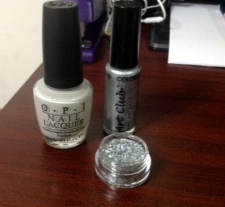 I received the OPI polish some time ago in a holiday gift bag from work. This past summer I tried it on my toes and was, well, underwhelmed with the result. So, it sat on top of my dresser and gathered dust. I love this manicure so, so much! Curse the yellow lighting in my room! It’s actually a lovely, creamy dove grey (took me three coats to get it this opaque.) I then tipped eight nails in the Art Club silver and put some fine face glitter (part of a set I got from Pop Beauty) over top, and put the chunkier silver Red Carpet Manicure glitter on my ring fingers. I drew a triangle with the silver polish before dipping my finger in the chunky glitter, and added a large rhinestone to top off the whole thing. 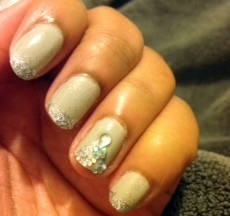 You’ll notice some of the glitter on the rest of my nail; that was dragged when I put the top coat on. But instead of making it look a hot mess (holy smokes was that a disaster of a manicure!) it just adds to the glitz. I’m tempted to try it with a more yellow based beige color and gold glitter to see if I like it as much. Not exactly the way I was supposed to spend my Saturday night, but I love the result of the diversion! Until next time, stay beautiful! ← Look What I Got! These silver colors are fab!